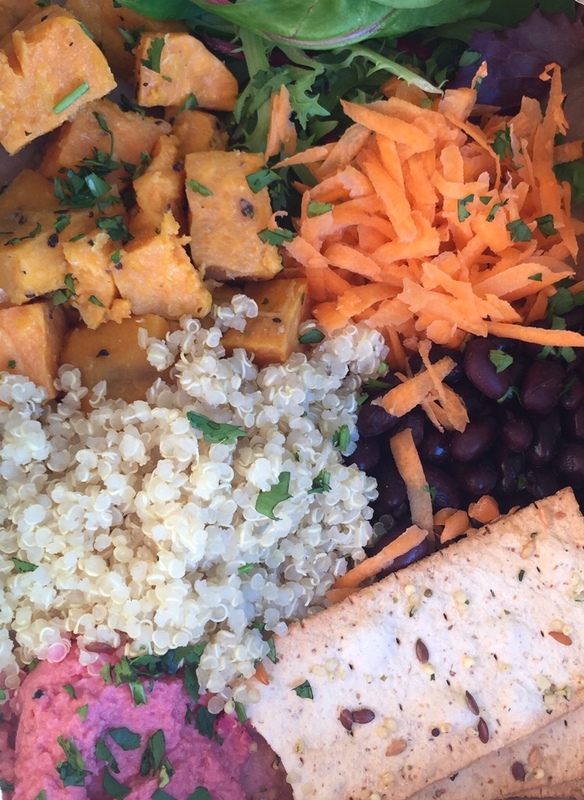 First of all thanks to my lovely friend Naomi for mentioning Sam on Facebook as she was scoffing one of his healthy plant based lunches delivered to her workplace last week. At just 22 years of age, Sam Passmore (pic below) started S.P. 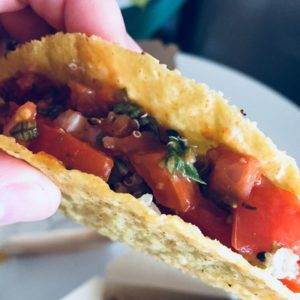 Nutrition a few weeks ago – yes weeks! So good on him and please do read on if you’re in the Exeter area and love delicious vegan food. 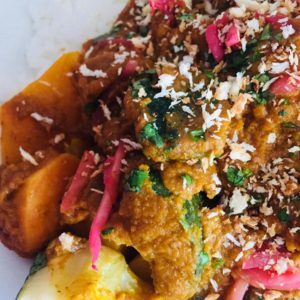 So basically – vegan chef Sam cooks up these awesome healthy vegan meals which he is currently delivering twice a week in Exeter on Tuesday and Thursday mornings. They are such good value at ONLY £5 including delivery. Sam is also offering an EXCLUSIVE 20% discount to our Super Savvy Vegan followers PLUS a free sweet treat – this will be whatever traybake or cake is on that week. 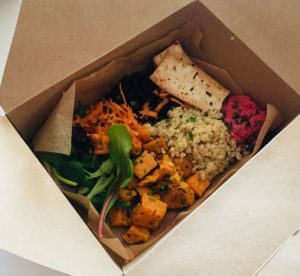 This is for your first order – a freshly cooked plant based meal delivered to you for just £4 which means you’d be a basic barmcake NOT to try them. And of course you are helping this talented young man get his wonderful vegan business established. The menu changes weekly and offers three choices (more on what we tried further down). It would be great if you added a comment below to let us know what you thought too 😋 thanks. They were all really really tasty. 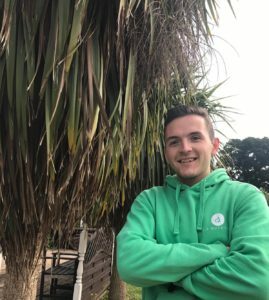 Sam’s training as a chef with the The Michael Caines Academy combined with his expertise on health and nutrition plus his own passion for vegan food results in dishes which not only look fabulous. They are delicious and healthy too. The smell was amazing as soon as we opened the cardboard boxes. Top eco marks for these and the wooden cutlery but it would be great to see plastic-free replacements for the little plastic tubs the salad dressings and guacamole were in. These meals were restaurant quality full of flavour and colour, the freshness simply shone through. They are such good value too for decent portion sizes. I particularly liked the sweet chilli salad dressing in the Buddha Box, the use of zingy spices throughout and the fresh herbs. My husband Dan and daughter Natasha were huge fans too. Dan loved it all and Natasha liked the taco’s and the Buddha Box the most. 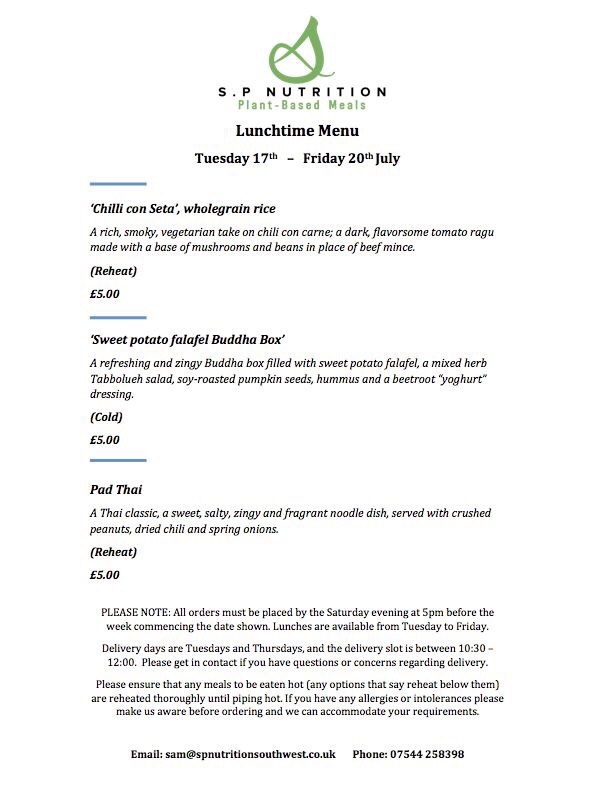 This is next week’s menu (17th July 2018) but it does change every week. I’ve already ordered Pad Thai !!! It’s delivered in the morning when Sam does his rounds but we’ll keep it cool then reheat it for dinner. Can’t wait ! Sam is hoping to increase the amount of days he cooks and delivers his food and may be adding some ‘healthy’ desserts to the menu too. We received complimentary meals in return for this review but we must stress these opinions are absolutely 100% our own. Thanks again to Sam. P.S. 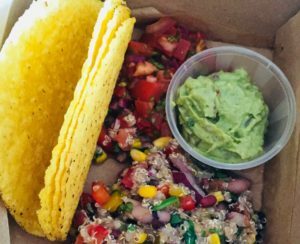 If you live in Exeter and you have not yet been to the vegan chippy – why on earth not? 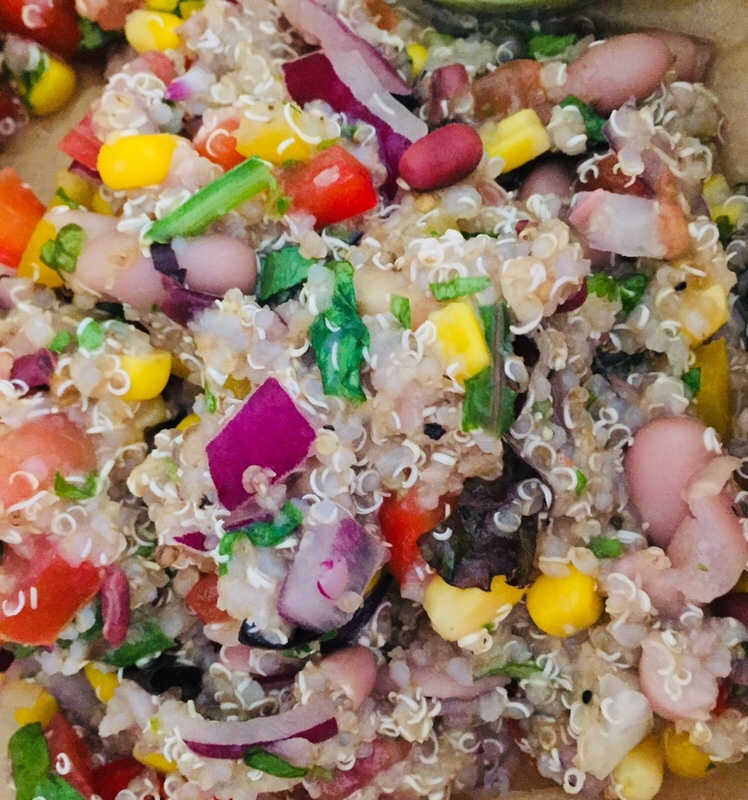 Look out for my list of recommended eateries in Exeter for vegans coming soon too…other towns will follow just as quickly as I can eat my way around the vegan cafes and restaurants of the UK !!! If you would like me to review your vegan delights (food or non-food) get in touch. Previous post: How are lemons not vegan?